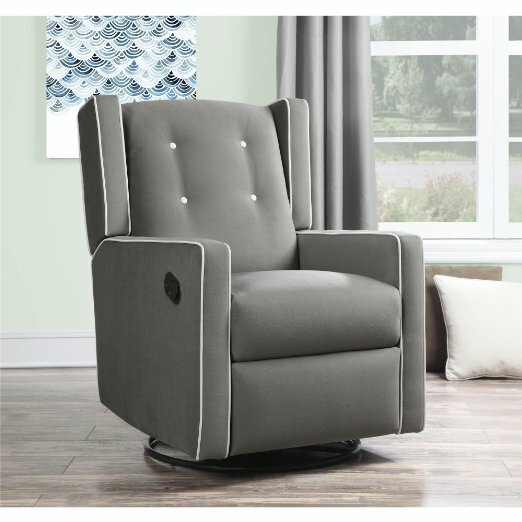 The Dorel Living Savannah Pushback Recliner is a rare small recliner that has a traditional style. 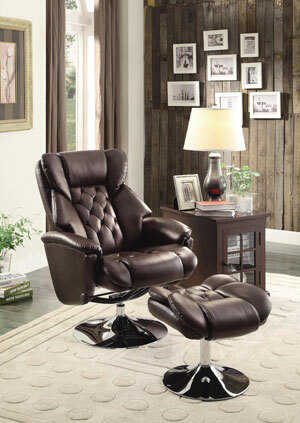 The leather recliner is the quintessential traditional living room furniture piece. Unfortunately, these stately chairs tend to be rather large and don’t work as well in small spaces. 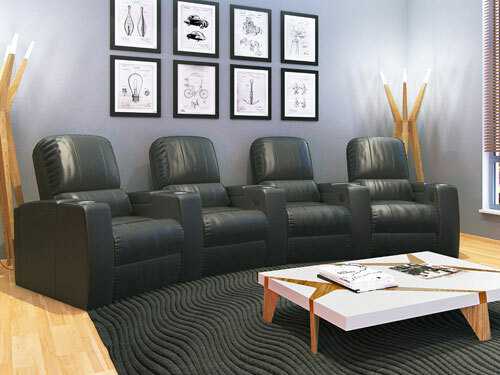 Fortunately, we’ve tracked down some of the best small leather recliners to help make the search for the perfect chair easier. Lets start with a short overview of the styles of chairs we found. 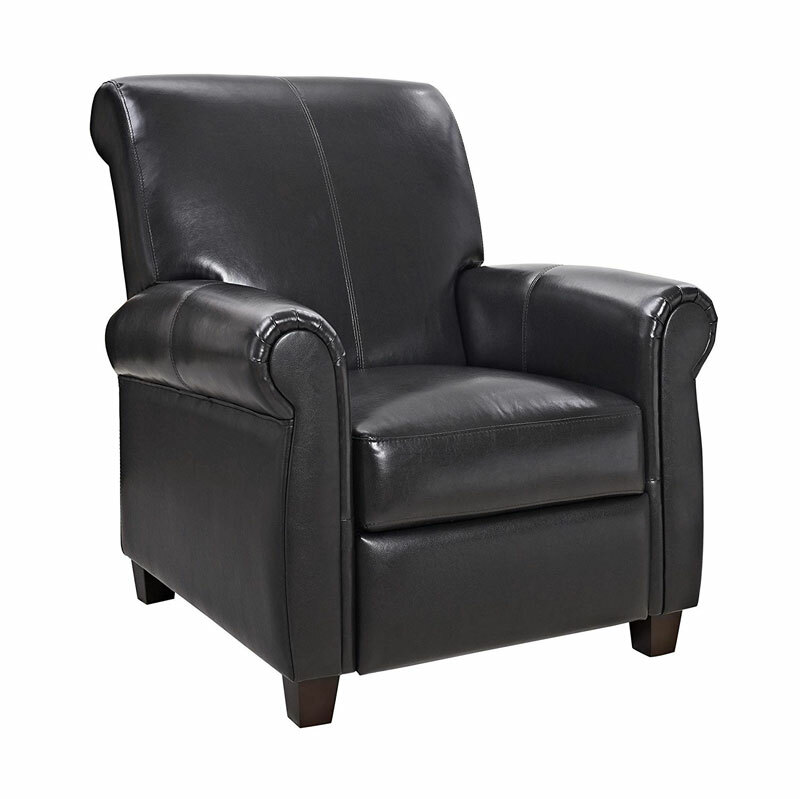 Many small leather recliners are club chairs, which have a smaller footprint than standard recliners. Recliner and ottoman sets are another style to consider if you’re tight on space, as they can be versatile in small spaces. While traditionally styled small leather recliners are hard to come by, we also managed to find one of those as well. In the chart below you’ll be able to quickly compare the options we found across size, ratings, and price. Continue reading below the comparison chart to get more details on a few of our favorite chairs. The Mac Motion Oslo Collection Recliner is a high-quality chair inspired by Scandinavian design. This chair features an adjustable reclining back, which can easily be changed by twisting a knob located on the chair’s side. Additionally, the chair’s base offers 360 degree swivel. The matching ottoman is designed with a contoured angle to make the set as ergonomic as possible when used in combination. Providing good lumbar support is another pro of this set. The chair is padded by a combination of solid cored foam and memory foam to simultaneously afford comfort and support. The upholstery is top-grain leather, making for a smooth and luxurious surface. Overall this chair earned high praise from reviewers and has garnered a 4.4 out of 5 star rating. The one drawback that was mentioned by several people was that the chair is in recline even at its fully upright position, making it uncomfortable to sit up straight in. 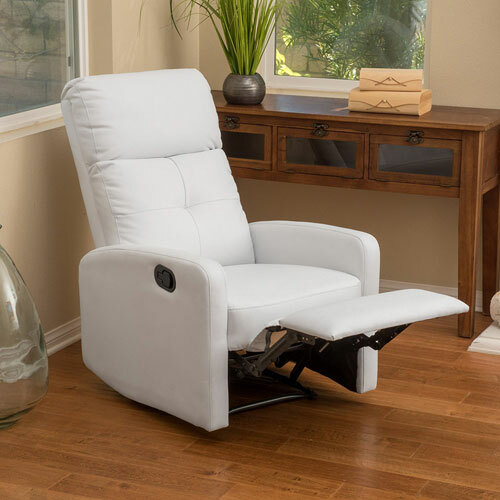 The Teyana White Leather Recliner Club Chair is a good budget-friendly small leather recliner. 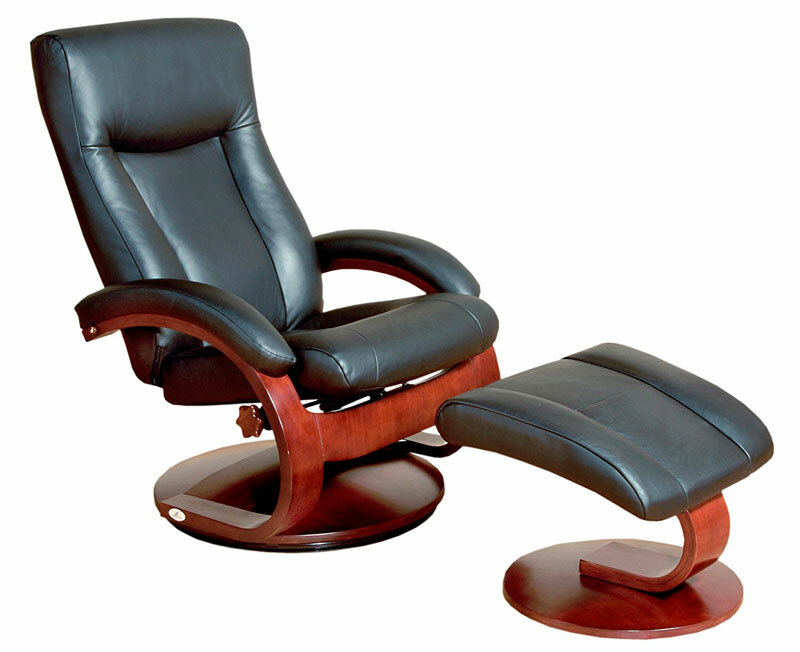 The chair’s back can recline to a flat 180 degree position, and its footrest comes up to support your legs. It is upholstered in PU leather. Keep in mind that this is a legitimately small chair, with the seat measuring 20.25 inches deep by 19.25 inches wide by 18 inches high. There are a couple of negatives mentioned in the reviews of this chair. First, some people found that the footrest is too difficult to push down. Second, some reviewers were critical of the chair’s quality. Barring those drawbacks, overall reviewers found that this chair provides good value. 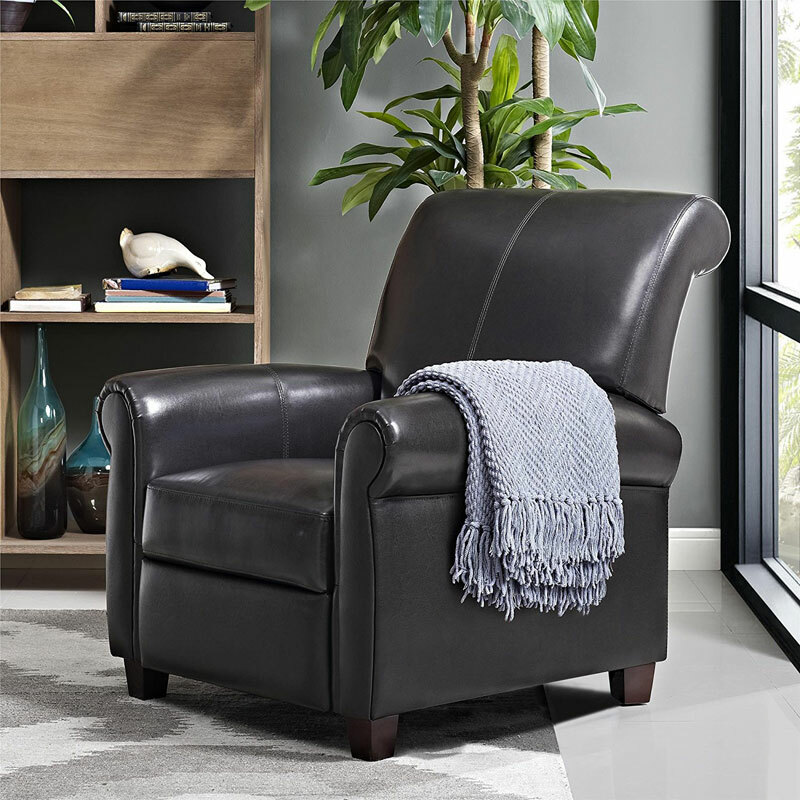 The Dorel Living Savannah Pushback Recliner is has a traditional look that is missing from the other small leather recliners we were able to track down. The chair features a stately rolled back and stylish rolled arms, giving it a polished and established appearance. The upholstery is a sleek espresso faux-leather, and the legs are solid wood finished in a matching espresso stain. 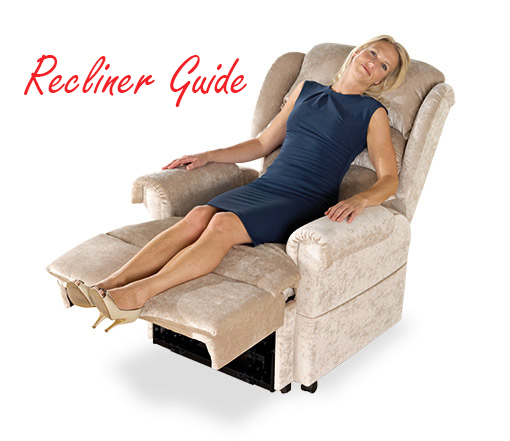 This model is a multi-position push back recliner, so one simply needs to push back when sitting in the chair to activate the recline mechanism. While not a tiny chair, it is undersized compared to a typical recliner. The chair’s seat is 20 inches wide by 22.5 inches deep by 19 inches high. It’s also important to note that this chair’s weight capacity is just 225 pounds.